The idea is, the Organization has taken Lee Marvin's $93,000 away from him, and he wants it back again. "I want my money back," he snarls about 14 times during "Point Blank." First he goes to the juice man, who doesn't have his money. So he kills the juice man. Then he goes to the next guy up, who can't get his money. So he kills him. Then he goes to the big shot's lieutenant, who won't give the money and tries to kill Marvin. So Marvin works it that the lieutenant and the bagman get shot by mistake. Then the big shot tries to give him the money and get shot by the Shadowy Figure who lurks above the Organization. The poor guy never does get his money. There are a few questions you may stumble across in your examination of this plot, and one of them Is phrased nicely by the big shot. "Good Lord, man," he tells Marvin, "do you mean to say you'd bring down this immense organization for a paltry $93,000?" The question is more or less rhetorical, since Marvin has already knocked off most of the board of directors, several hired gunmen and a secretary or two. You'd think the Organization would let him have his $93,000, and good riddance. 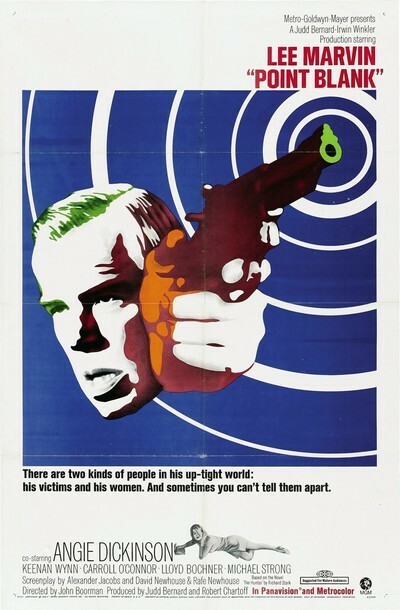 But if they'd forked over, there wouldn't have been a movie, and as suspense thrillers go "Point Blank" is pretty good. It gets back into the groove of Hollywood thrillers, after the recent glut of spies, counterspies, funny spies, anti-hero spies and spy-spier spies. Marvin is just a plain, simple tough guy who wants to have the same justice done for him as was done for Humphrey Bogart.